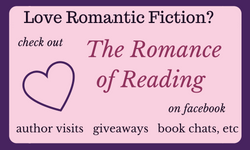 Welcome to Read-A-Romance Month 2016! If you’re a new visitor to RARM, I hope you’ll come back every day in August to read all the wonderful pro-romance posts this year. Check out the full calendar here. You can also find links to the last three years’ posts from the boxes in the sidebar, and if you’d like, you can follow RARM on Facebook. Enjoy August! How did you ever fall in love with romance? I started before I even read romance novels, thanks to movies and books I read as a child. Who can ever forget Maria and Captain Von Trapp in The Sound of Music? Or Pa and Ma Ingalls in the Little House books? The Sound of Music taught me so much more about romantic love than “boy meets girl; they fall in love and live happily ever after.” To this day, I never get tired of Maria and Captain Von Trapp’s scene in the garden house when he tells her he can’t be with the baroness because…he’s in love with someone else! And they sing, “Something Good,” to each other, which is as profoundly beautiful as vows spoken at a wedding. But I learned much more about romance from The Sound of Music. I learned that romantic love can have a sharp edge to it. Even children feel the pain of the scene where Maria packs her bags and leaves the house to return to the convent, heartbroken and lovesick. Liesl’s romance taught me that you can be betrayed by even the sparkliest kind of love. That was a big lesson, almost impossible for a sheltered child like me to comprehend. But the extreme betrayal Liesl suffered, which involved chilling potential consequences like death and imprisonment, broke through that layer of safety I was cocooned in and made me see that risks are involved when you give your heart to someone–it can be flung right back at you. And from the captain’s failed romance with the baroness, I learned that sometimes you have to leave love behind because it just isn’t right. It either isn’t love at all, when you thought it was, or it isn’t Big Love. I understood these truths, thanks to this movie–and those lessons were helpful to me as I started to grow up. The Little House books taught me a lot about romance, too, before I was old enough to fall in love. Pa and Ma’s relationship was a great example of love celebrated in good times and clung to in bad times. And Laura and Almanzo’s romance taught me that when someone loves you, it’s the little sacrifices–like those daring, long sleigh rides Almanzo took to pick Laura up from the dreary house in which she boarded when teaching–that speak loudest of all. When I became a teen, I started reading books tagged as romance, and I’ve never stopped. But guess what? I wound up marrying a guy like Almanzo. He tells me he loves me in quiet, everyday ways. That’s an awful lot like Pa Ingalls, too. My husband is also a military man with a strong sense of duty and a love for his country, like Captain Von Trapp. Yes, I’m a romance fan. And until I thought long and hard about it, I never realized that the seeds for that love were planted in my childhood. I’m grateful not only to my favorite romance writers for reminding me of love’s power but to the wonderful print and film storytellers who led me to these amazing authors. What about you? What seeds were planted in your childhood that led you to love romance novels? She’s the author of the new, fabulous It Girl series. Leah’s an old friend–she also married a military man, and we met in Charleston. 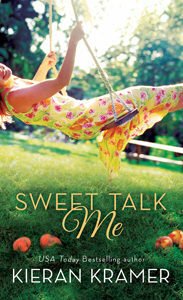 She writes awesome chick lit that’s super funny! I laugh on every page of her books. You will, too! Tell us about a moment in your life when you felt romance surrounding you. When I was in a beautiful formal garden behind a house in downtown Charleston, I felt romance surrounding me! The garden had been there for two hundred years, and it was where couple after couple, over the decades, had strolled and tried to escape from prying eyes inside the house. The scent of jasmine and gardenia was intoxicating! 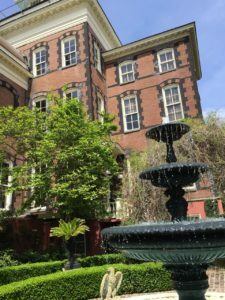 I could have sat on the bench and looked at the fountain, flowers, and beautifully cut hedges for hours and daydreamed about how big a role that garden played in bringing couples together. Tell us about someone special in your life (other than your partner) with whom you share romance. My sister Devon and I talk about romance a lot. We both have single adult children, and we’re always hoping they’ll find true love. Plus, we love to gossip about Hollywood romance. I was bereft when Taylor Swift and Calvin Harris broke up! And by the time this gets to print, will she still be with Tom Hiddleston? My sister and I can’t stand when seemingly good couples in Hollywood break up!!! But we’re always ever-hopeful they’ll find lasting romance. Do you have a place in the world or a sound that you equate with romance? Yes, Charleston is exceedingly romantic, especially Legare Street and for me, Tradd Street, because that’s where I got engaged. But I also love the Great Smoky Mountains, where my latest contemporary romance, TROUBLE WHEN YOU WALKED IN, is set! Talk about romantic…if you haven’t seen this beautiful mountain chain, please go someday! And until then, read TROUBLE for a little taste of mountain magic. Who is your (or a) favorite romantic couple? Kate and William, of course! They’re a darling couple. I love them. They’re sensible. They care about the world. And I love that they have a special passion for addressing children’s mental health issues, which often go unnoticed and untreated. Tell us about your dream date. My dream date would involve a couple’s massage, haha! And a desert island. And good food, really good food that involves chocolate cake! We’d also have our favorite comedians do stand-up. But then they’d be shipped off the island, and we’d have it to ourselves. You can bet I’ll be naked and skinnydipping at some point. Or maybe frolicking in the surf in a polka-dot bikini. And we’d both surf on this date and have a competition, and I’d win. My man would have to do anything I said because he lost the surfing competition. And that’s where I’ll stop telling you about this daydream because now it’s switching to a date in the mountains: there’s a cozy cabin. It’s late fall. I’m always debating: beach or mountains? It’s hard to decide!!! Both places are so romantic!!! 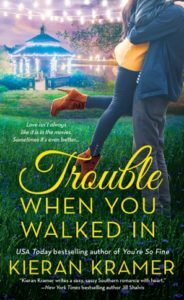 Kieran Kramer is generously giving away one copy of TROUBLE WHEN YOU WALKED IN, either digital or print, to two separate winners. US only, apologies to international friends. To enter the giveaway, leave a comment below or on the *Facebook post you’ll find here (or both – Share the Love!) ;o) by 11:59 pm PST August 19, 2016. Good luck! 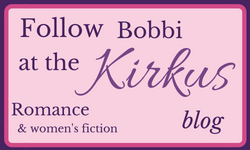 USA Today bestselling author Kieran Kramer currently writes fun contemporary romance for St. Martin’s Press. A former journalist and English teacher, Kieran’s also a game show veteran, karaoke enthusiast, and general adventurer. 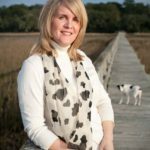 She lives where she grew up-in the Lowcountry of South Carolina-with her family. *Please note that the Amazon button, most cover images and many text links connect to a Read-A-Romance Month affiliate portal. 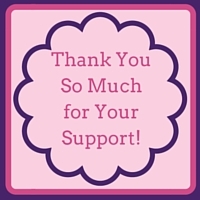 Thanks so much for your help & support!